Magdalena, New Mexico - The historic Magdalena stock pens. Tens of thousands of sheep and cattle each year were driven here from as far as eastern Arizona to board trains for slaughter houses back east. The stock pens were in operation from 1885 to 1971. 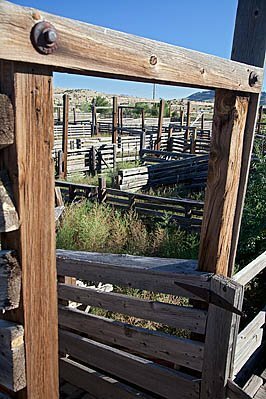 Image Description: Magdalena, New Mexico - The historic Magdalena stock pens. Tens of thousands of sheep and cattle each year were driven here from as far as eastern Arizona to board trains for slaughter houses back east. The stock pens were in operation from 1885 to 1971.